Dr. Darin Gerdes is a leadersmith who has spent most of his professional life cultivating leadership in others. 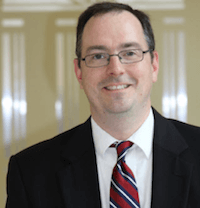 Dr. Gerdes holds undergraduate degrees in Government and Psychology from Liberty University and an MBA, an MA in Public Policy, and a Ph.D. in Organizational Leadership from Regent University. He is a Professor of Management in the College of Business and the Director of Instructional Technology at Charleston Southern University. In his previous role as Director of Graduate Programs in the school of Business, he designed the Master of Arts in Organizational Leadership program and co-designed the Master of Science in Human Resource Management program. Dr. Gerdes serves as the Director of Education for Great Business Networking (GBN) and the President of the Southeast Case Research Association (SECRA). He is a member of the Academy of Management (AOM) and the Christian Business Faculty Association (CBFA). He was the recipient of the 2018 Christian Business Faculty Association Teaching Award.